I’m one of millions of drivers who use an external amplifier to make sure I can hear every bar of music over the honking horns of the highway. 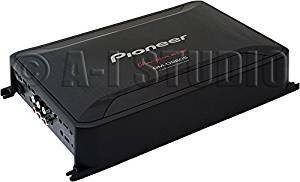 I’m going to show you the best car amps for less than $500 to help you customize your vehicle’s sound system, so you can experience crystal clear audio to help drown out road noise. Why do I need a car amp? There’s a huge advantage to having an external car amp. You see, all cars come with some sort of amplifier already installed. Unfortunately, these amplifiers tend to be cheaply produced and underwhelming. If you want to blare Bruce Springsteen songs while traversing those often sung about stretches of American highway without having to suffer through peaking and distortion, you’re going to have to fit your vehicle with some extra sound equipment, and an external car amp is a good place to start. A high-quality amplifier will give you crystal-clear audio, allowing you to hear the individual voice of every backing singer. Get your hands on a good car amplifier and you will be able to experience your music as the artist intended, no matter where you are or where you’re headed. If you have never purchased a car amplifier, you may be a little intimidated by the prospect of picking one out. 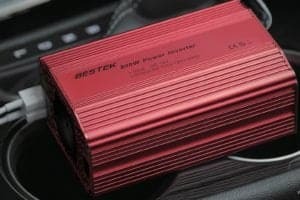 While there isn’t any one way to separate the best car amplifiers from the less impressive alternatives, there are a couple of things to remember to keep you on track while you shop. You should be mindful of how many speakers your amplifier will be connected to, as it will have an impact on how many channels it will need. 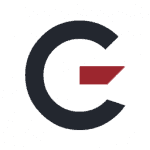 Multi-channel car amplifiers are generally recommended, but you may be able to get away with a single-channel amplifier if you are only planning to connect that amplifier to a subwoofer. It’s also important to keep in mind the model of your speakers and what level of power they require to perform to an acceptable standard. If you go with an amplifier that is not capable of effectively powering your speakers, you’re going to be sorely disappointed with the end result. If you are unhappy with your car’s factory speakers and are planning to upgrade, I highly recommend you take care of that before purchasing a car amplifier. It is far easier to find a quality amp for your speakers than it is to find quality speakers for your amp. Installing a car amplifier isn’t all that difficult, but it can be a little daunting if you’ve never done it before. 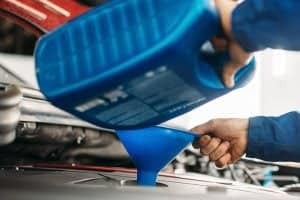 You might be tempted to turn to a mechanic for help, but that really isn’t necessary. If you can find an hour or so in your day to dedicate to the installation process, you should be able to fit your external amplifier without professional intervention. 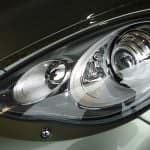 Car manufacturers don’t want you screwing with their work by making your own additions to your vehicle, so they don’t exactly make it easy for you to do so. There is no designated space to fit an external car amplifier, so you will have to get creative. Many car owners who use external amplification keep their amplifier beneath the driver’s seat of the vehicle. This is a good idea because it doesn’t take up too much space in the car, but it can be a bit of a problem if you have children who like to reach under seats in search of stray toys or pieces of candy. Another option is to store your amplifier in the trunk of your car. This is an ideal spot if you have the room, but if you’re somebody who likes to (or has to) carry multiple items in their trunk at a time, it may be necessary to find a different location for your amp. There isn’t any right or wrong answer when it comes to where you should store your car amplifier. You simply need to find a space in your vehicle where your amplifier can be placed without impacting the comfort of your passengers or impeding your driving ability. This video will help you learn more about how to install a car amp. Not to scare you away, but car amplifiers can be pretty freaking expensive. Dedicated audiophiles who insist on having the finest audio equipment available have been known to spend tens of thousands of dollars on in-vehicle amplification. Fortunately, the best car amplifiers are not always the most expensive. 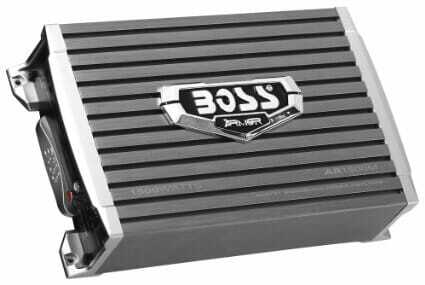 Those who prefer quality over status will be able to find a superb car amplifier for only a couple of hundred dollars. As I mentioned earlier on, the amplifiers I’m about to show you can all be purchased online or in-store for less than $500. However, each will give you a quality of sound you would never have imagined possible from your vehicle’s speakers. The Rockford Fosgate R500X1D is a single-channel amplifier and at less than $120 has proven extremely popular with those who want to improve their in-car audio system without breaking the bank. Cast aluminum heat sink—On any good road trip, the playlist begins the moment you pull out of your driveway and doesn’t stop until you arrive at your destination. For that reason, you need to get an amplifier which can endure long periods of use without overheating. The Rockford Fosgate R500X1D is fitted with a cast aluminum heat sink, ensuring it can be used for hours on end with only a minimal increase in temperature. Infrasonic filter—When an amplifier is tasked with producing notes which are below the human level of hearing, its output becomes distorted. The Rockford Fosgate R500X1D is fitted with an infrasonic filter which detects inaudible low frequencies and tunes them out, preventing any harm from coming to your speakers or your ears. Short life span—The R500X1D doesn’t have the greatest life span. Some drivers have reported getting three years out of it, which is commendable for a budget amplifier, but others have reported running into problems after just one or two months. For over 30 years, BOSS Audio has been among the premier manufacturers of mobile audio. Those looking for an example of BOSS Audio’s superiority need look no further than the AR1500M. Remote subwoofer control—Anybody who has used an amplifier with no remote control capabilities knows how stressful it can be trying to get the levels just right ahead of a long car journey. The BOSS Audio AR1500M features remote subwoofer control, allowing you to adjust the bass from song to song without leaving the driver’s seat. Prone to overheating—To sell this amplifier at such a low price, BOSS Audio had to make a couple of sacrifices. For example, the AR1500M is lacking in its ability to manage temperature increases. If you plan to use this amplifier for extended periods of time, it may be necessary to give it a 10-minute break every 90 minutes to minimize the chances of it overheating. While it might be a little more expensive than the other amplifiers we’ve looked at so far, Pioneer enthusiasts insist the Pioneer GM-D9605 is well worth the cost. Compact design—The Pioneer GM-D9605 is designed to be as lightweight and as compact as possible. Its ergonomic design means it can be fitted in your car with ease and won’t take up too much room in your trunk (or wherever else you decide to install it). Multi-channel amplifier—Despite its small size, the Pioneer GM-D9605 has the ability to power your entire sound system. With a total of five channels, this amplifier ensures you get the most out of every speaker in your vehicle (four channels to power your speakers and one channel dedicated to your subwoofer). Background noise—Some long-time Pioneer devotees feel this amplifier falls down in areas in which the brand usually succeeds. For example, the GM-D9605 seems to give out a lot more background noise than most other Pioneer speakers. 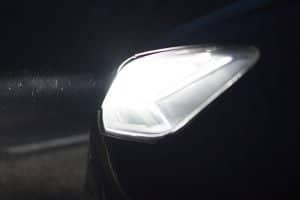 Though it can’t be detected while the car is in action, a clear buzzing can be heard coming from this amplifier when the engine has been shut off. 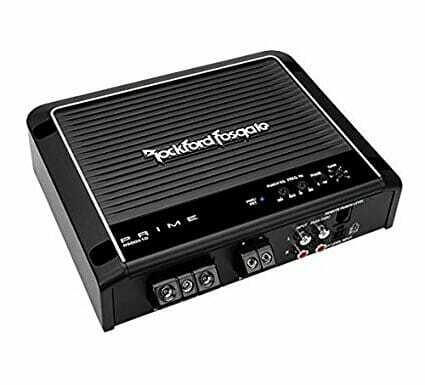 This Rockford Fosgate is the second amplifier from Rockford Fosgate to appear on this list and is another example of RF’s dedication to quality and innovation. 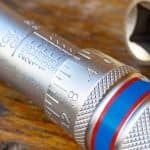 Ideal for motorcycles—If you want to update the sound system on your motorbike, you might experience a bit of trouble finding the perfect amplifier. Rockford Fosgate designed the PBR300X4 with bikers in mind. Its compact design means it requires very little surface space and can be safely fitted to a wide range of motorcycles and recreational vehicles. On-board Punch EQ—The PBR300X4 features Rockford Fosgate’s on-board Punch EQ, meaning your audio can be easily adjusted according to your preferences. Those who want to increase the bass need only set the EQ to LP, while those who want to enhance both bass and treble have HP and AP settings to play around with. 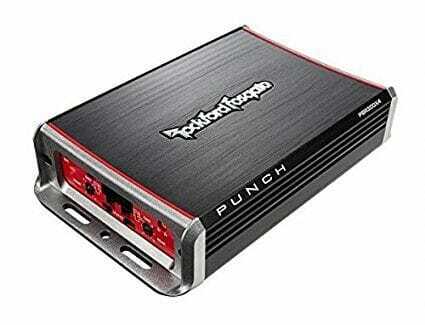 Bass is lacking—The Rockford Fosgate PBR300X4 just doesn’t boost bass to the standard of most other car amplifiers. While it does offer some increase in bass levels, those who want to achieve that thumping bass sound should look elsewhere. The final car amp I want to show you is the KAC-9106D, and I’m sure you’ll agree it is a pretty good way to finish things off. 2,000 watts—It’s pretty difficult to understand just how powerful a 2,000-watt amplifier can be without hearing it for yourself. 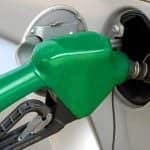 However, if you compare it to the average human conversation, which comes in at less than 2 watts or the average blaring siren, which is 1,024 watts, you can imagine its power. Powers low impedance—The Kenwood KAC-9106D can be used to power the lowest of low impedance speakers. Even when paired with speakers of 2 ohms, this amplifier will make sure you hear every note of your music. 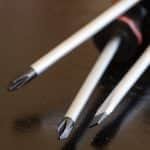 Poor high-frequency capabilities—While discussing the shortcomings of the previous amplifier, I mentioned that it doesn’t offer a whole lot in terms of bass enhancement. With this amplifier, the situation seems to be reversed. 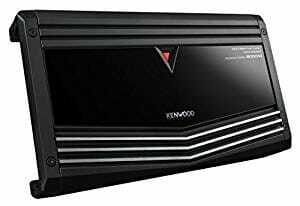 A class D amplifier, the Kenwood KAC-9106D is more than capable of giving you that thumping bass, but it leaves a lot to be desired when it comes to producing high-frequency sounds. The amps included here all offer fantastic sound quality and a series of handy features unique to themselves. So, it’s pretty difficult for me to say which is the best car amp for you without knowing your personal preferences. What I will say, however, is that the most versatile amplifier on this list—and therefore the one most suited for the majority of people—is the Pioneer GM-D9605. While the Pioneer GM-9605 may stretch your budget a little more than you were planning, it still comes in at less than $500. For your money, you get an amplifier with multiple channels, each of which will be devoted to a single speaker. 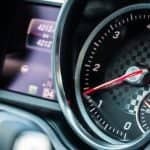 When your vehicle’s speakers are paid equal attention in this manner, the audio output becomes clearer and the quality becomes more consistent, with minimal, if any, pops or jumps.